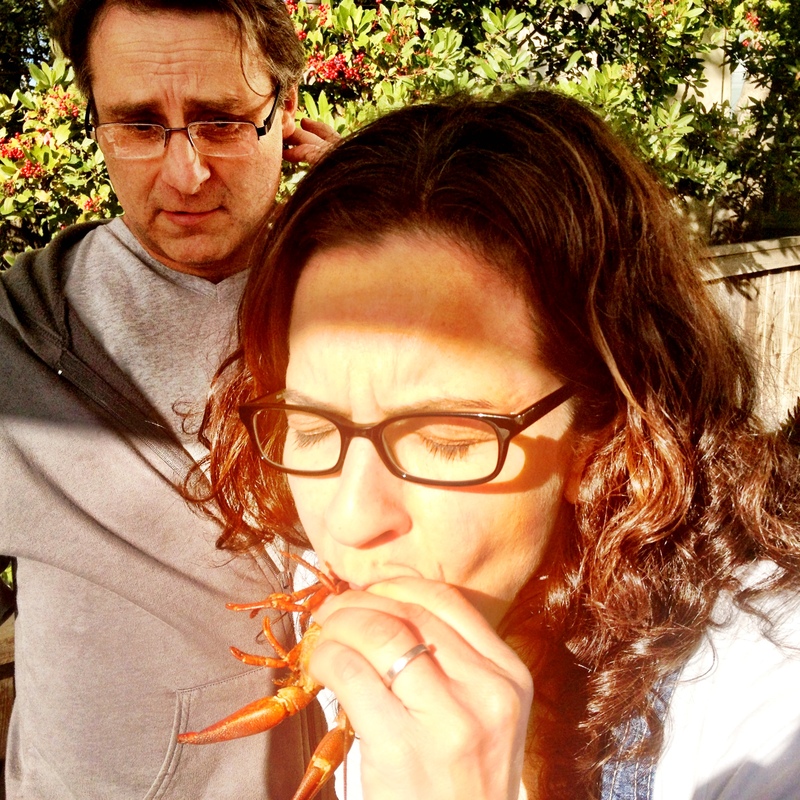 My friend Tami Lipsey Linde, and her husband Peter hosted a crawfish boil for ten over the weekend. Tami and I used to work together at Chronicle, way back in the days when I was just starting on cookbooks. A Jewish girl from Louisiana, Tami can make a great raunchy joke and mean cocktail while maintaining a delicate Southern charm. I found myself inebriated after the first batch of her signature pink Hurricanes and into the festive spirit of the boil. Tami’s husband Peter added that some people somewhere call them “mudbugs”. Whatever you want to call them, a pot of crawdads is a great thing to make for a crowd—an extravaganza of shellfish, vegetables, and spice! The first thing you need is a pot. 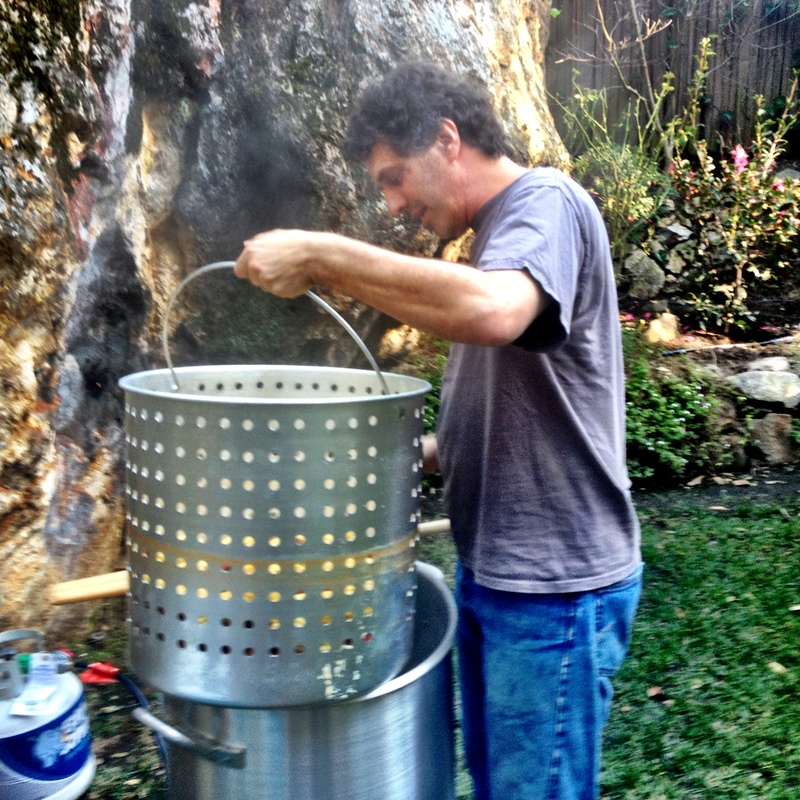 Tami and Peter’s looked like this Bayou Classic Stock Pot and Steamer which they set up over a gas flame in the backyard. The longest part of the process is waiting for the water to come to a boil. And of course you need crawdads! 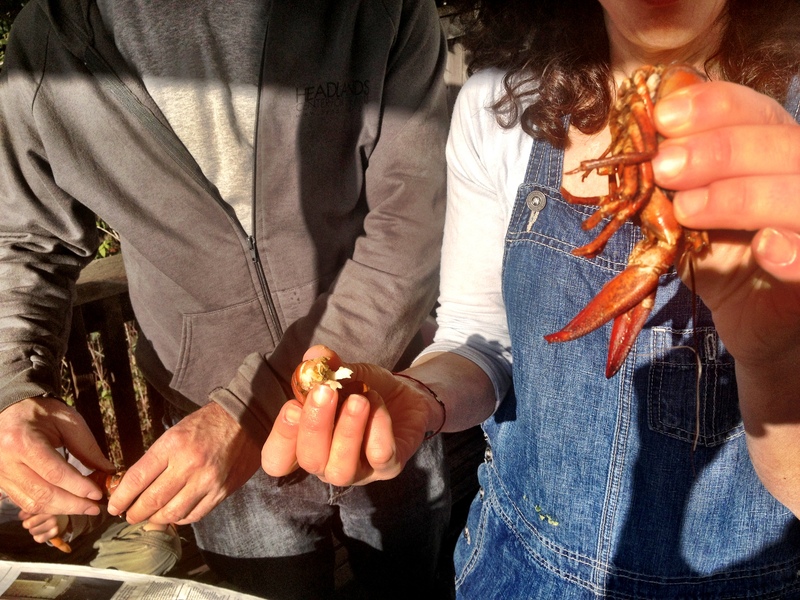 When Tami and Peter plan in advance, they order their crawdads from a source in Louisiana but for our spontaneous Saturday gathering they bought the last 10 pounds from Ranch 99, a Chinese market in El Cerrito. 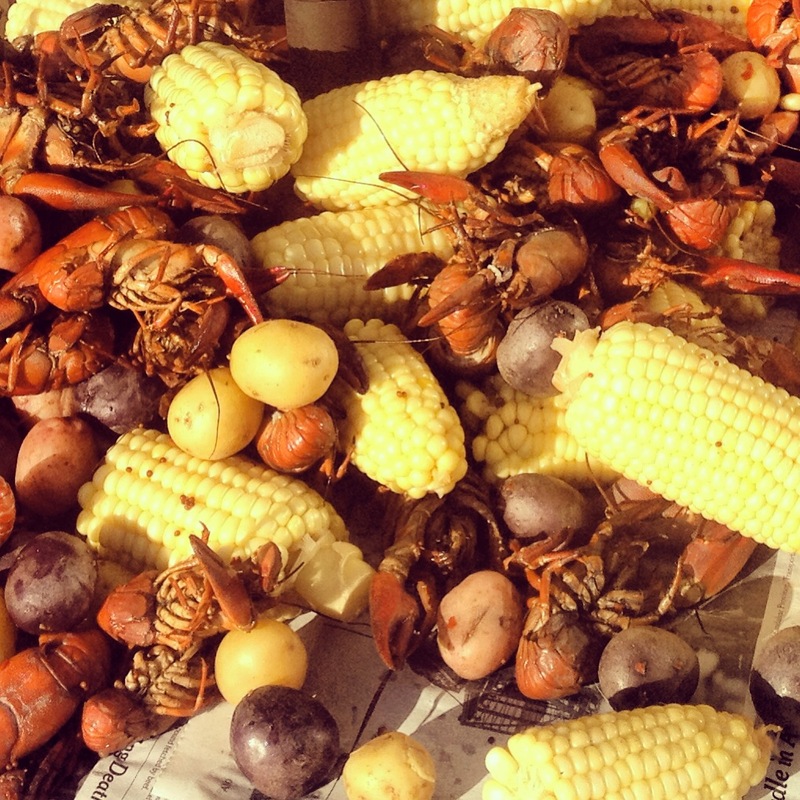 To make the crawdads, you boil the water with classic seasonings, add corn and potatoes, and boil some more, then add the crawdads for 2 minutes before turning off the heat and letting the crawdads soak in the spicy broth. 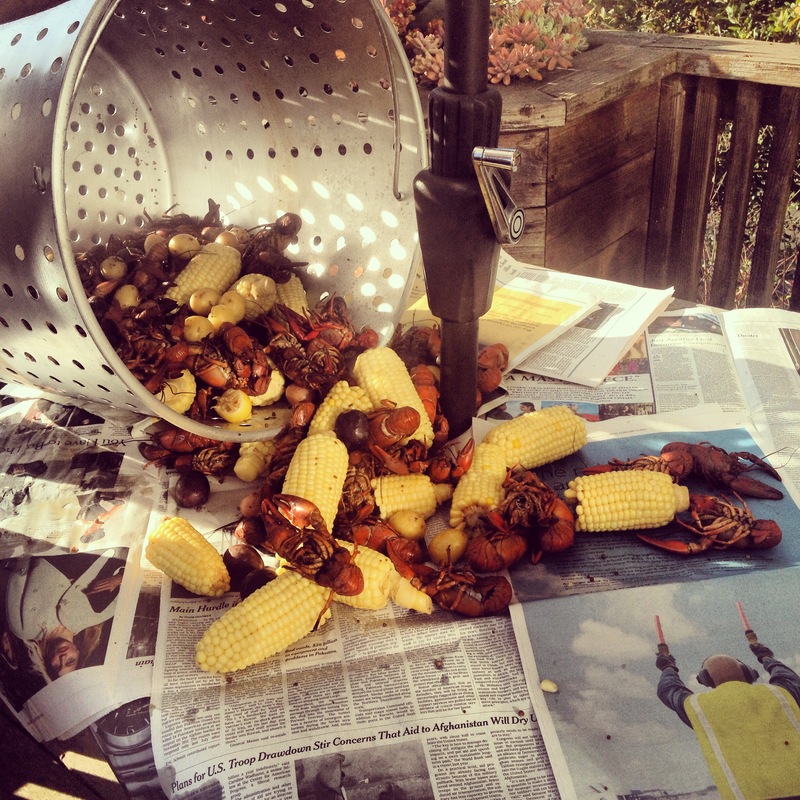 After 20 minutes, you pull up the strainer, pour the mess of steaming shellfish and vegetables on to a newspaper-lined table, and serve with hot sauce and cold beer. Then you squeeze the body until the shells crack and you can pull out the meat. This often takes a long time, encouraging good conversation, drinking, and raunchy jokes if you are lucky! It is normal in Louisiana for someone to eat 3 pounds per person, but if you have lots of corn and other accompaniments 1 pound per person is very satisfying. 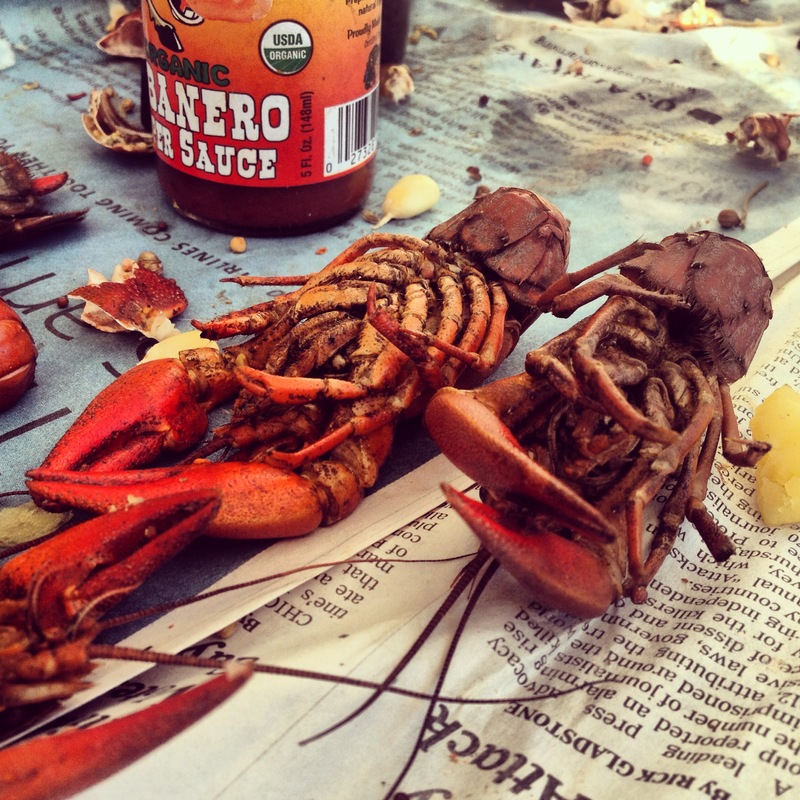 The crawdads are often dirty when you buy them so make sure to rinse them a few times. 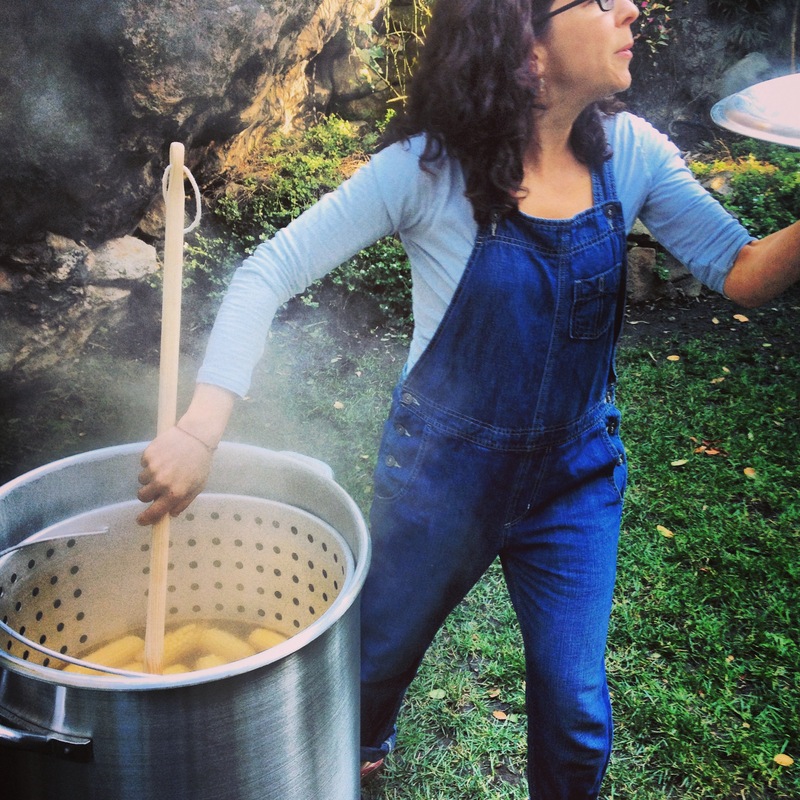 You will need a good sturdy place to set up your boil. An outdoor set up is best. Do they go into the pot alive? Nope. They don’t survive long out of water so they will not be alive or “screaming” in the pot. It’s my biggest scam: Every year, I invite my mother to my vodka and latke party. My mom is the latke fairy. She is my secret strategy for throwing an excellent party. I find the location, invite the people, and she shows up with my father and a massive cooler. Many purists would disagree with her process of freezing off batches and that she uses a food processor, but if they had one of her crispy, golden pancakes sizzling hot out of the oven, they might change their minds. Also the alternative of standing over the stove frying for 2 at a time is not as fun as feeding seventy-five happy people. We serve our latkes with bowls of sour cream, apple sauce, wild smoked salmon, and braised brisket. Here is to celebrating the potato in all its forms! 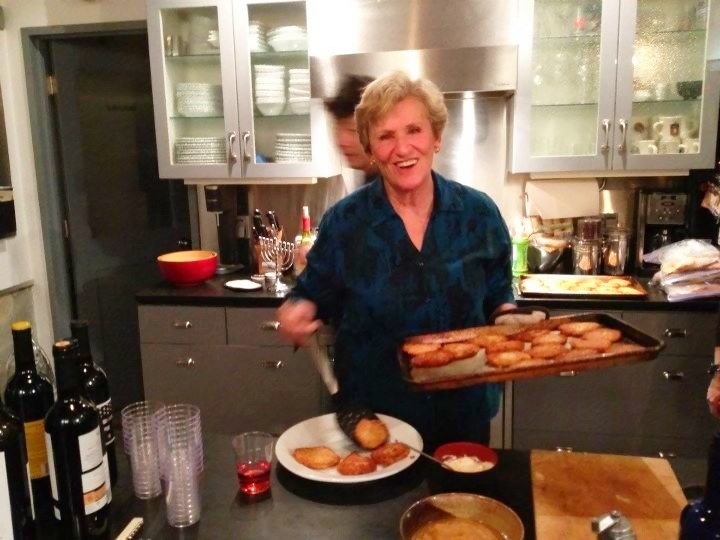 My mother’s recipe is a variation on Marlene Sorosky’s version in Fast & Festive Meals for the Jewish Holidays. When making latkes for a big group of people, my mother makes batches of 25 at a time and freezes them in resealable plastic bags. It is a lot of work, so she might make 4 batches over a month. Then she reheats them in a hot oven the night of the party. Mistaking my mother’s latke preparing expertise for my own, I agreed to do this video for CHOW.com with then senior producer Meredith Arthur. Place the water and vitamin C tablet in a large bowl and stir until the vitamin C is dissolved; set aside. Shred the potatoes through the shredding blade of a food processor. Remove the shredded potatoes and fit the food processor with the blade attachment. Working in batches, return the potatoes to the food processor and pulse until they are the size of rice grains. Add the potatoes to the vitamin C mixture and stir to combine. Shred and pulse the onion in the food processor using the same method as with the potatoes. Add to the bowl of potato mixture along with the matzo meal, eggs, measured salt, and baking powder and stir until incorporated. Pour 1/4 to 1/2 inch of the oil into a large frying pan and heat over medium-high heat. Once the oil is hot enough to fry (you can check by sticking a wooden utensil into the oil and seeing if bubbles form around the edges), use a large spoon to drop 3 to 4 mounds of the potato mixture (about 2 generous tablespoons each) into the hot oil. Do not crowd the pan. Flatten the latkes slightly with the back of the spoon. Fry until golden brown, about 2 to 3 minutes per side. Remove the latkes to paper towels to drain and season with additional salt. Repeat with the remaining batter. When you reach the end of the batter, pat the mixture with a paper towel to remove any excess liquid before frying. Serve immediately or to freeze: Let cool completely and store in between wax paper in large sealable bags. Store in freezer. To reheat frozen latkes: Preheat over to 425 degrees F. Let latkes thaw for 20 minutes. Place latkes on cookie sheet and bake until hot and sizzling, about 10 minutes. When my dear friends Jill Santopietro and Meredith Arthur asked me to make cookies for their “Cookies for Kids’ Cancer” bake sale, I decided to use my stand-by recipe for butter cookies. Since the bake sale was going to be hosted by San Francisco food professionals, I knew that there would be an assortment of gorgeous treats so my strategy had to be simplicity. I hatched a plan to distinguish my cookies by decorating with blue sprinkles–targeting what I perceived to be the underserved “Hanukkah Christmas Cookie” market, but we only had pink and purple sugar crystals (and I burned the first batch) so my plan was thwarted! The sale took place in front of 18 Reasons, who had generously donated their space. Inside a group of volunteers hosted a cookie decorating session for kids while everyone was prepping and drinking coffee. As I suspected, the table was filled with gorgeous silver cake pops and coconut macaroons; peppermint chocolate bark, and elegantly wrapped double chocolate chip cookies. Peanut butter fudge Christmas trees covered in red, green, and white dragees sparkled next to chocolate covered salted caramels, all made by a fantastic group of bakers and San Francisco foodies including Jill, and the amazing bakers at Chow, Bi-rite, and Michael Minna among others. The team of volunteers took my paltry cookies, bagged them in cello wrapping, and and put them out right next to a bag of Anthony’s famous chocolate chip cookies. Cookies for Kids’ Cancer was started by Gretchen Holt-Witt when her son Liam was diagnosed. Gretchen had a crazy idea for a larger-than-life bake sale with the goal of baking 96,000 cookies with friends and volunteers. All 96,000 cookies were sold in three weeks, thanks to the work of over 250 volunteers. Since that time, other subsequent bake sales have raised over 4.5 million dollars to battle kids cancer and the movement is going strong. It was a gorgeous day and everyone was so happy to be out in the sun. The best part of the sale was talking to the people who came by, telling them about the cause, because here’s the thing: There are no prices on any of the baked goods. People take what they want and then donate what they have and the cool thing is that each dollar is matched 3 times by sponsors including Starbucks, OXO, and Glad. We raised $2,225 that day which meant that we actually raised close to $7,000. My shift was ending and I didn’t want to leave, and then I noticed a little girl holding a bag of my cookies. I stood and watched as she ate the whole bag in front of me –purple sprinkles and all.